Transit operator Keolis has begun to gather real-life experience with electric transport as the first VDL Citea Electric bus was put in service in Orléans, France. Keolis operates the articulated e-bus on various lines. The Citea SLFA-180 Electric is VDL’s electric bendy bus and longest model. For both the carrier, Keolis Métropole Orléans, and the Orléans metropolitan region this is the first electric VDL bus to be used on various busy lines in the city as Keolis intends to electrify widely. As a system supplier, VDL Bus & Coach is also responsible for the installation and maintenance of the charging station. The VDL Citea SLFA-180 Electric has a 169 kWh battery pack for a range of about 100 kilometres. The 18-metre EV can fully charge in 35 minutes via a pantograph with a Heliox 300 kW rapid charger. In Orléans, this happens at the depot in Saint Jean de Braye. Keolis started testing various electric buses from different suppliers in Orléans back in 2017. This ultimately led to the delivery and recent commissioning of the first VDL Citea SLFA-180 Electric for France. 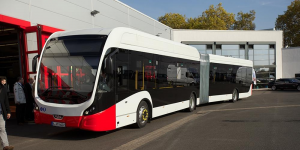 The ambition of the Orléans metropolitan region is to have all public bus transport emission-free by 2024 reportedly, in line with the plans of the central government in Paris.